Canon U.S.A. unveiled the specs of its highly anticipated EOS 5D Mark III Digital SLR Camera, which is expected to ship by the end of March for a MSRP of $3,499.00 for the camera body, (or $4,299.00 with a EF24-105mm f/4L IS USM zoom lens kit). The announcement coincides with the 25th anniversary of the launch of Canon’s first EOS system – the EOS 650 SLR, which debuted in March of 1987. It is packed with a 22-megapixel full-frame CMOS image sensor that supports ISO 100 through ISO 25600 in standard mode, and can also be set to ISO 50, ISO 51200, and ISO 102400 if needed. Its Digic 5+ imaging processor can process images with 17 times the speed of the previous Digic 4 version for high-speed JPG and Raw image capture. Event photographers will also appreciate the ability to capture Raw images at 10.5-megapixel and 5.5-megapixel resolutions if desired—perfect for shots that aren’t going to be made into large prints. 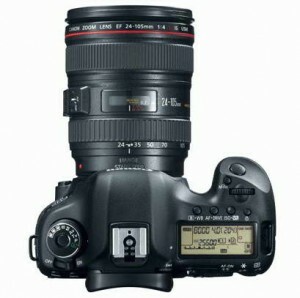 Of course, the camera also supports Raw capture at the full 22-megapixel resolution. The camera’s 61-point autofocus system promises to lock into focus quickly in order to capture action, which can be done at up to 6 frames per second in continuous drive mode. Both are big improvements over the 5D Mark II—it only has 9 autofocus points and is limited to shooting at 3.9 frames per second. The camera’s video recording capabilities are also improved—it now supports a slew of HD formats, all with H.264 compression for easy editing. You can use the camera to shoot 1080p24, 1080p25, 1080p30, 720p60, and 720p50 HD video. It can also capture standard definition footage at 25 or 30 frames per second. Video files are limited to just under 30 minutes in length per clip, but the camera is able to automatically break clips up on the fly, so you won’t notice the limitation while recording. The camera has a built in microphone for audio, and also sports a stereo mic input as well as a headphone jack for in-field audio monitoring. The Mark III’s rear LCD is 3.2 inches in size and features a 1.04 million dot resolution—slightly higher than the 920k dot screen found on the Mark II. Of course, the camera also features an eye-level pentaprism for traditional shooting—it now offers 100 percent coverage, up from the 98 percent coverage delivered by the Mark II. Dual card slots—one Compact Flash and one SDXC—allow you to use your choice of memory cards. 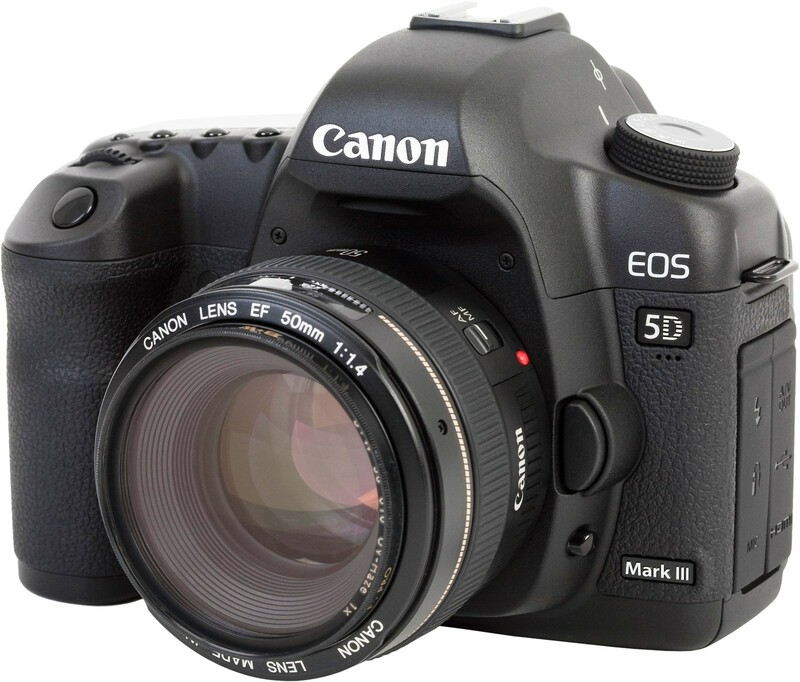 Photographers who are moving up from a lower-end Canon D-SLR will be able to continue to use SD memory, and those looking at the Mark III as a complement to a 1D series camera will be able to share CF cards between them. The dual card slots can operate in one of three ways—you can choose to write the same data to two cards for real-time backup, write Raw files to one card and JPG files to another, or simply use the second card as additional storage after the first one fills up. Canon also announced a variety of new accessories for the camera including, the Canon Wireless File Transmitter WFT-E7A, which connects to the camera’s USB port to deliver wireless LAN access. With this new WFT model, professionals can synchronize clocks on multiple cameras and use the unit to support linked shooting when utilizing multiple cameras. Canon is also introducing an optional GPS Receiver (GP-E2), which can be connected to the camera via the accessory shoe or a USB cable. With a GPS logging function built-in, the GP-E2 will log latitude, longitude, elevation, and the Universal Time Code – and users to watch the camera movement on a PC after shooting. With its built-in compass, the GP-E2 receiver also records camera direction when shooting. In addition, the company is offering a new Battery Grip (BG-E11) for the Mark III that accepts one or two LP-E6 lithium-ion battery packs or a set of six AA-size batteries. This new grip has a multicontroller and a multifunction (M.Fn) button together a with a full set of grip controls for easy operation when shooting portraits or other vertical format photos. Posted on March 5, 2012, in Gadgets_ Camera and tagged Camera, Canon, EOS 5D Mark III Digital SLR, Gadget, headphone jack, technology. Bookmark the permalink. Leave a comment.